Jawfish is a peculiar small bottom-dwelling species which makes wonderful addition to any saltwater community aquarium. Unlike its other tank mates that spend most of their time swimming around, the marine fish is different from the rest because their normal routine daily activities mainly focus on digging the substrate to make a small hole fit for them to hide in and when they are not burrowing, you will find them staying upright with the head pointing upwards waiting for their prey. Its comical behavior will never fail to impress any observer and it is also affectionately famous for its quick movement that can change the whole aquarium landscape in just under a day. Their unique ability to hold the substrate in their mouth and then spit it out, allows them to finish their task very quickly. Thus, don’t be surprised that if you have fine aquarium sand substrates, you will notice that your fish will soon go missing and hid underneath the dug holes. There are at least 20 to 30 species that belong to the jawfish group of family. 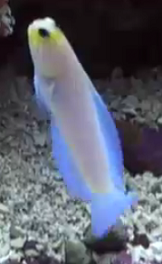 Among them, the most popular is the "Yellow Head" or sometimes called "Pearly" jawfish. It can be easily identified based on its light creamy blue body color with only the head appearing pale yellowish. The other notable species belonging to the same group that are worth mentioning here are the "Blue Spotted" and "Dusky" jawfish. But however, unlike the pearly yellow head, the other two are not considered among the favorites because their dark brownish color appearance do not seem to attract attention of hobbyist. Nevertheless, all the fish that belong to this Opistognathidae family have one thing in common is that their behaviors are all the same while appearance wise in terms of body structure, it can be seen that the rear dorsal fin actually extends all the way from head to tail. Some aquarist have actually mistaken them to be dottybacks with some resemblance in terms of body size but both fishes are actually not really related to each other. Favorite foods to feed your pets should be shrimps and small feeder crabs. If you can’t afford to provide natural live foods all the time, I would suggest using high quality marine pellets and providing occasional feed of special meal whenever available. There are even zooplankton mixtures which are sold in some aquarium pet stores but nowadays I've rarely seen it. Your jawfish will definitely enjoy those as they will dash out from their hiding spot and quickly grab the food. If for any reason that you find your fish are not going about with their daily activities and rejecting the food offer, this should trigger an alarm to immediately check for deteriorating water quality and signs of disease.